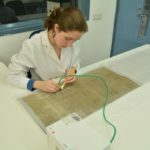 By Laura G. García Vedrenne, first year student, MPhil in Textile Conservation. Different types of soiling can be found altogether in historic textiles. 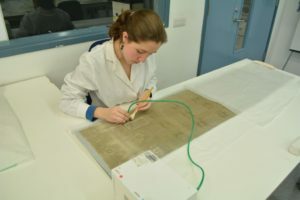 When this happens, conservators find it useful to classify or characterize each type of soiling in order to match its removal with a specific cleaning process. To sum it up: the best way to remove or diminish the undesired dust and stains in a textile is by understanding its nature! 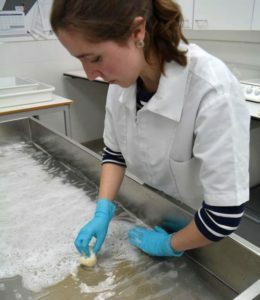 During the wet cleaning module, each first-year student is assigned a white object to document and conserve. I was given a length of woven fabric (E.1988.105.256/CTC.362) from the collection of Glasgow Museums, one of five which were perhaps made as samples. The textile has an open-textured plain weave made out of cotton threads that are extremely fine and slightly irregular in diameter. A discontinuous supplementary weft is used to create a decorative geometrical pattern by forming three and a half rows of dotted spaces that intersect ten columns of round floral designs. E.1988.105.256/CTC.362 before conservation © CSG CIC Glasgow Museums Collection and University of Glasgow, 2017. Overall, the front of the textile had more soiling than the back. However, different concentrations and types could be distinguished in selected areas. These were further classified (see diagram below) as presence of loose dust particles (A), surface and embedded soiling (B) and ingrained soiling, with a high quantity of particles embedded into the fibres (C). When observed under the USB digital-microscope, the particles looked fine and dark coloured, which indicate the possible existence of soot. Electrostatic attraction makes these carbon particles attach strongly and they can easily penetrate the fibres. Condition before treatment: Location of different types of soiling and yellowed areas © Laura G. Garcia Vedrenne, CSG CIC Glasgow Museums Collection and University of Glasgow, 2017. Another aspect to consider was the differential yellowing, which is usually caused by the degradation products of cellulose. The discolouration is mostly concentrated at the centre, on the right part of the textile, and it reduces as it reaches the edges. As would be expected, the pH of the fibres that have yellowed was slightly more acidic (pH 4.4 -5) than the ones with low quantity of dust particles deposited on the surface (4.7-5.5). Once the nature of the soiling was understood, a suitable cleaning treatment was proposed and matched accordingly. The loose particles were removed by vacuuming. The sooty areas were further cleaned by using a conservation grade kneadable putty rubber that could pick up the carbon particles without creating more electrostatic. 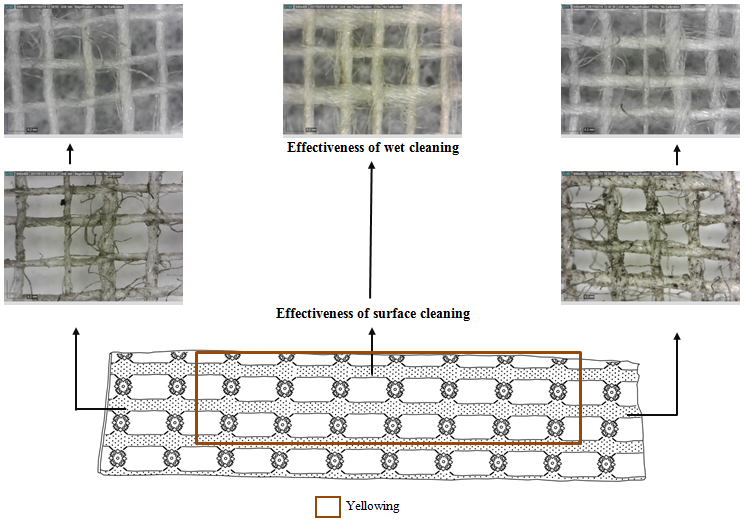 The wet-cleaning was aimed at reducing the yellowing of the cotton fibres. 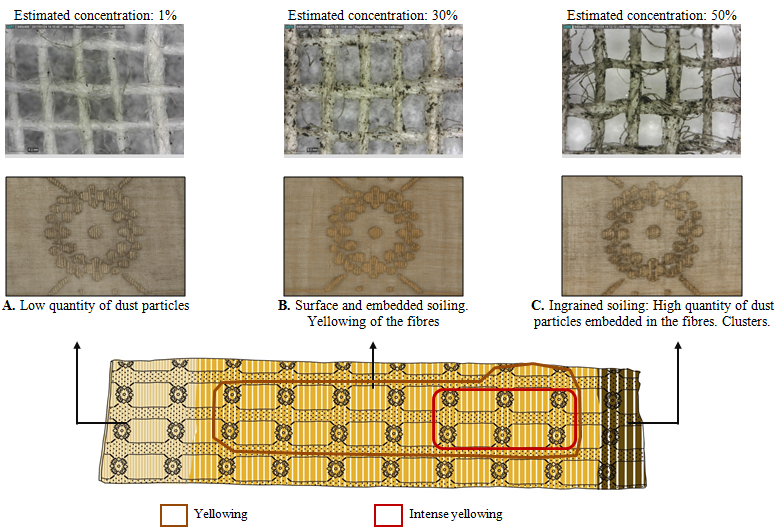 Two-wash baths of conservation grade detergent and a buffer solution were used to solubilize the cellulose degradation products and to control the acidity during the aqueous immersion of the textile. Surface cleaning (above) and wet cleaning (right) of woven fabric © CSG CIC Glasgow Museums Collection and University of Glasgow, 2017. After all, the treatment was quite satisfactory. Not only was the object stabilised and freed from its bound soiling, but it also improved its tactile quality and appeal. I was really happy to see the final results. As first-year students, our next challenge will be to wet clean a coloured object. Let’s wait and see if we can keep our calm during that task too! Condition after treatment: Location of yellowed areas © Laura G. Garcia Vedrenne, CSG CIC Glasgow Museums Collection and University of Glasgow, 2017. E.1988.105.256/CTC.362 after conservation © CSG CIC Glasgow Museums Collection and University of Glasgow, 2017.